This past month we issued a challenge to Strongtown where we asked people to see how far they could row in a month. The only caveat was that any rowing done during a class warm-up / workout did not count towards their monthly tally. To say this challenge took off is a bit of an understatement. It was amazing to see people dig in and try to squeeze out any extra meters when they could. We had people rowing before class, after class, we even had (at least) one instance of taking days off from work to get a bit more quality erg time. 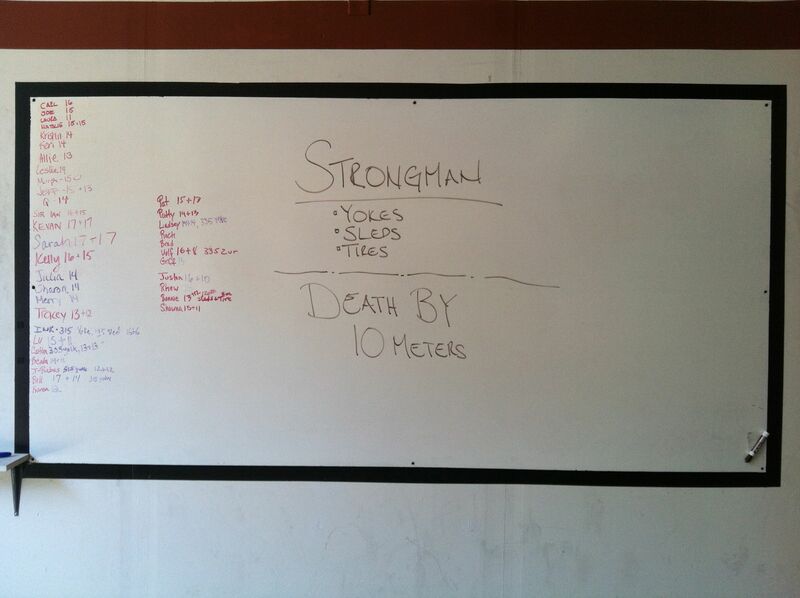 As a community CrossFit Strongtown rowed a mind boggling total of 988,866 meters! That is approximately 614.5 miles rowed in 30 days! As a point of reference that is the equivalent of rowing from Southbury CT to Columbus Ohio. It became evident pretty early on that we had a few people who were truly in it for the long haul. Even though we told them the prize was most likely a free $1 bottle of water they were unphased and committed to seeing what they could accomplish. The Women rowed a total of 260,213 meters! It was a constant leap frogging back and forth between Sydney and Coach Becky for the overall lead. Becky would come in early to row...Sydney would go on late night rowing binges. The month ended with Sydney rowing a 15k on the 30th to push her to a total of 80,087 meters (50 miles)! Coach Becky ended with a very impressive 71,682 meters (44.5 miles)! Our Men rowed a total of 728,653 meters this month....with 550,075 of those meters rowed by Tanner & Chris! Where Sydney and Becky would leap frog back and forth it seemed like Tanner & Chris spent the entire month on the rower. Whether it was outside, next door, or in the corner of the room I felt like every time I was at the gym at least one of them was rowing. The challenge ended with Tanner arriving at the gym at 2:30 on Thursday, rowing until the 4:00pm, taking a break to join the class workout, and then continuing to row until 9:30pm. He rowed 55,000 meters on Thursday and an additional 35,000 meters on Friday to finish the month with a total of 300,075 meters....which is 186.5 miles. Chris finished the month with a 250,000 aka 'a quarter million' meters rowed, or 155.3 miles. Congratulations to our September 'Row Away' Challenge winners! Your prizes (I promise it's not a bottle of water) are on their way and should be here by the end of the week. Each round, each movement increases by 3 reps.
Toon and Bill during the 6am class. 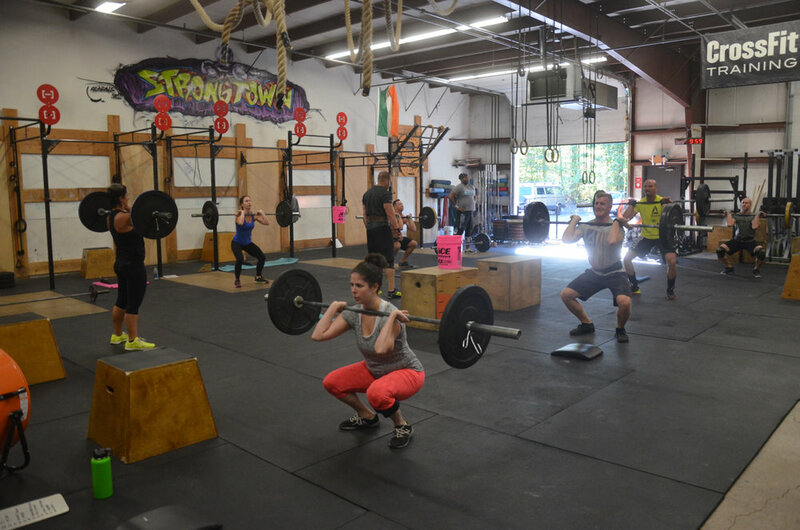 Kathleen and the 9:30am class during the front squat portion of the workout. 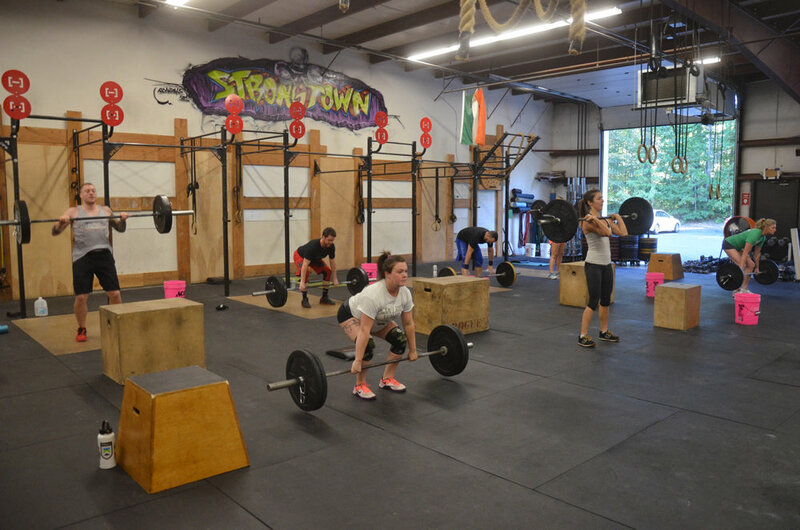 The 5:00pm class attacking the power cleans. For this month, log as many rounds of Cindy as possible. Don't be afraid to get creative! Maybe try a baseline Cindy for yourself in the beginning of the month then switch to variations like strict Cindy, double Cindy, half Cindy, Cindy with jumping squats (yikes), or change up the rep scheme. Whatever work you put in, no matter the variation, will help prepare you for Murph at the end of May.